French President Macron receives congratulations from Malcolm Turnbull. Malcolm Turnbull has congratulated France's new President. 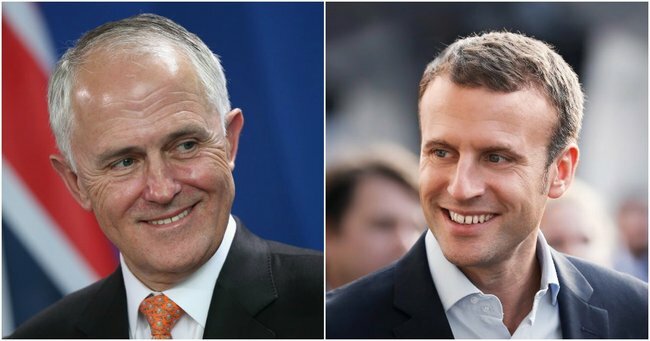 Prime Minister Malcolm Turnbull has congratulated Emmanuel Macron on his historic election win as French president. But instead of a phone call, letter or email, Mr Turnbull sent a text message to Mr Macron after he defeated far-right leader Marine Le Pen. “I got a response back thanking me for the congratulations and looking forward to working together,” Mr Turnbull told reporters in Canberra on Monday. Mr Macron’s election comes at a time of shared projects for France and Australia, including the huge submarine deal with naval contractor DCNS, he said. Both nations also have a shared history in terms of conflict. “We have been side-by-side in freedom’s cause for over a century and we are side-by-side in freedom’s cause in the Middle East today,” Mr Turnbull said. Labor leader Bill Shorten is pleased Mr Macron has been elected. “When mainstream right-wing parties work with mainstream left-wing parties to block out the extremists we do better and I think that’s probably the lesson I take out of this for Australian politics,” he told reporters.